We joined English Heritage & The National Trust just before we re-homed Hachi the Malamute with a view to ‘castle bagging’ during our time back in the UK. We didn’t even give it a second thought as to how dog friendly those castles were or even consider that they might not allow dogs to enter. Woops! 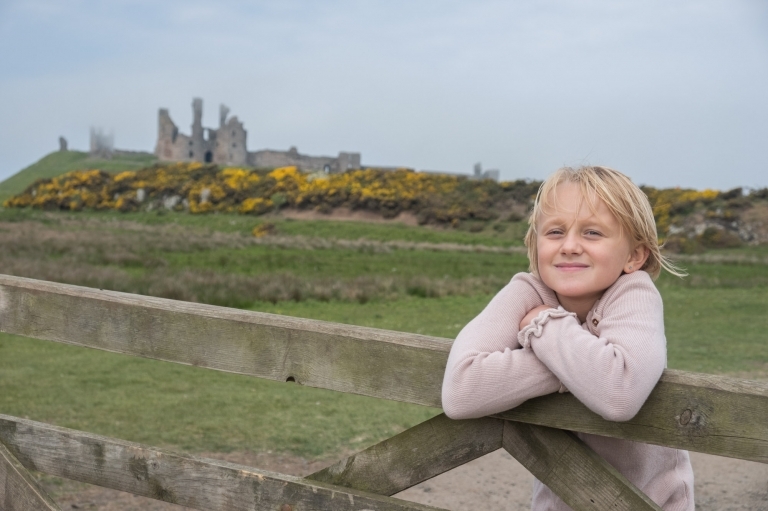 Dunstanburgh Castle, Northumberland, in the background with our youngest. Up until that point I only had three kids to contend with and that, in some respects, was very easy. Children are effectively allowed anywhere now. We no longer see signs in shops & restaurants saying ‘No Children’ but I hadn’t been aware of just how many signs still state ‘ NO DOGS!’. I understand why dogs are not permitted inside furnished castles however I am still quite baffled as to why dogs are not allowed in the grounds and gardens? It doesn’t make sense to me. We turned up at the enormous castle of Banburgh in Northumberland only to be turned away because of said hound. All was not lost though because we played on the beach for ages, however, we then had to change all of our castle ideas to incorporate the dog. We left the UK in 2011 and our youngest two children were too small to remember it. Having studied Australian history (only the nice bits!) and French history, they had no real understanding of British history so I had this grand plan to go castle bagging during our ten day visit to Northumberland and teach them a little bit about English history. I’m not sure my plan to teach them anything worked but they took an interest, read all the signs and seemed happy to visit more! Owned by English Heritage this priory, inside a castle, sits on a very blustery headland looking out across the north sea. The Maldives it is not but if you have weirdo kids, like ourss, they’ll find the grave stones interesting and you can turn it into a maths exercise. You’ll only need to allow an hour to visit here as it’s a small site however the town of Tynemouth is quaint. Walk along the front to the two beaches, the Spanish battery, the Collingwood Monument and along the sea wall to the Heritage Centre where you can explore 900 years of maritime heritage. If the weather is good you can walk out to the North Pier lighthouse which dates from 1854. To check if it’s open, contact the North Pier Watchman by phone – +44 (0)7824 310937. 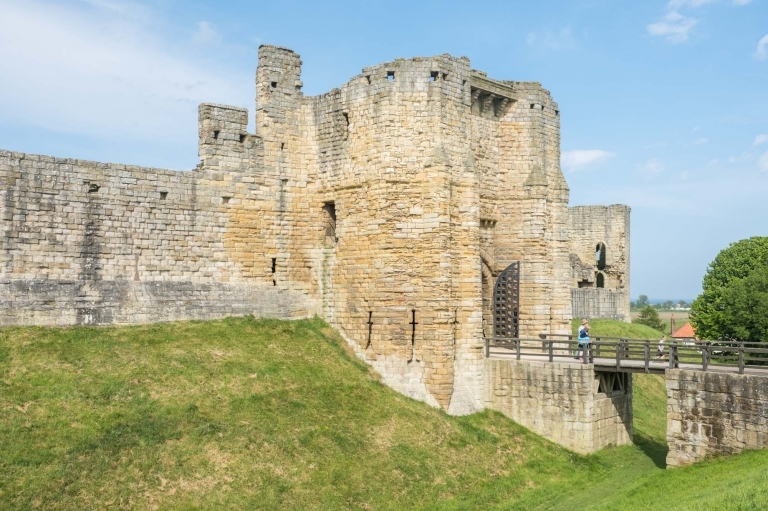 Warkworth is an excellent example of a 12th century island castle enclosed by the mainland with steep embankments and a moat. The castle is surprisingly deceptive; what looks like a ruin actually houses magnificent rooms, staircases and fireplaces. There’s loads to explore here but watch out for the interior steps as they’re a bit slippy. 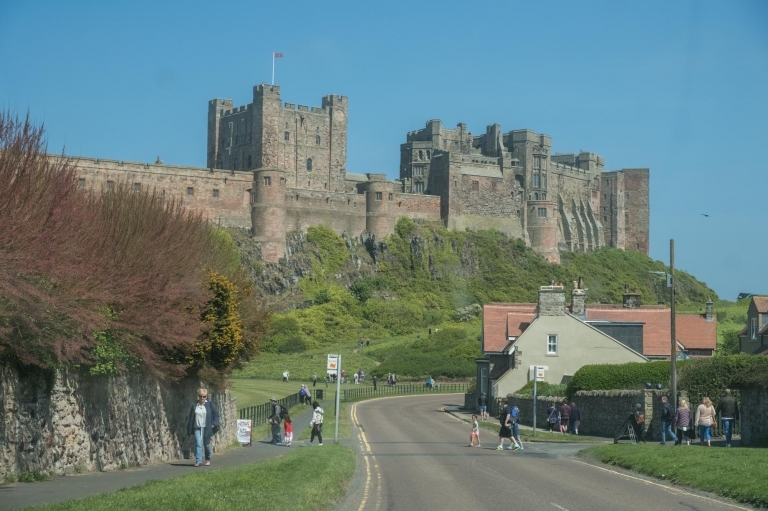 Once home to ‘Harry Hotspur’, immortalised as a rebel lord by Shakespeare, and bane of Scottish raiders this hilltop castle has excellent views over the River Coquet and surrounding countryside.With the quaint town and sandy beach near by, Warkworth is a delightful place. If you’re looking for a short walk, click here. Click on the ‘map page’ to see the exact walk as it’s easier to understand than the written instructions. Standing against a backdrop of sheer cliffs and rolling fog, these ruined castle walls are only accessible by foot. 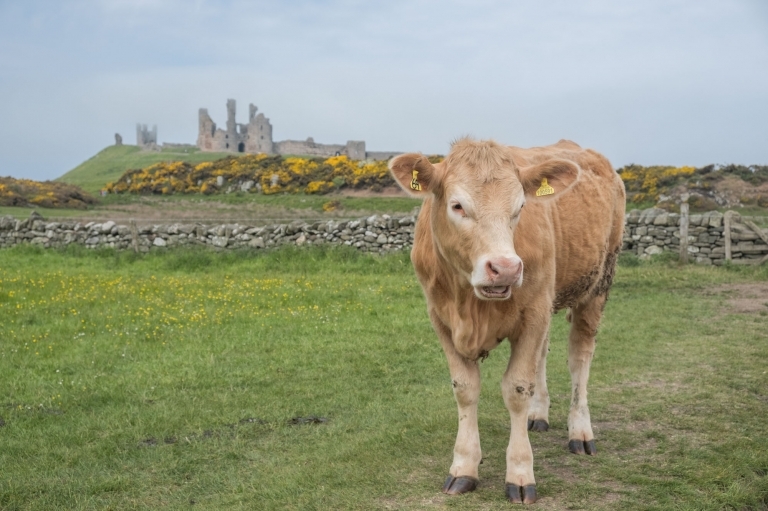 In order to get to Dunstanburgh you must park at Craster (paying car park) and walk. It’s a very easy walk and doesn’t take long at all, maybe 20 minutes. If you’re lucky you’ll bump into the very cute calves that are put out for pasture there. There’s not a huge amount to see within the castle walls, although they were vast and you can still imagine how grand it must have been. Our kids and dog had a great time down on the rocks to the front of the castle and we even found a pair of Arctic Tern nesting. If the walk from Craster is not enough you could try this longer circular 6m/10km hike to Low Newton. You can ONLY get to Lindisfarne at LOW TIDE. Check the tide times here. Do NOT get stuck on the causeway and cost the coast guards £2,500 to come and rescue you!! Holy Island has a recorded history from the 6th century AD where it was an important celtic christian centre. After the viking invasions and Norman conquest of England the castle was built in 1550. The castle was heavily under restoration when we visited and will remain that way until 2019. The island measures 3 miles (4.8 km) from east to west and 1 1⁄2 miles (2.4 km) from north to south, and comprises approximately 1,000 acres (400 hectares) at high tide and miraculously the island has a full time population of about 200 people!! There are lots of different walks you can take around the sand dunes of Holy Island that take in the breathtaking North Shore and The Snook but this 6.5 mile circular route is my favourite. Fancy a delightful wander along the River Tweed, returning past Norham’s former railway station and ancient, deadly castle? Norham is perhaps my favourite ruined castle from this list because we had the entire castle to ourselves however it was once described as the most dangerous place in England! That was back in the 14th century when it was repeatedly ramshackled by the Scots. This castle was rebuilt up to five times before being bombed in the second world war. We walked down through the town and across to the famous bridge that straddles the border to Scotland. This walk is 4.5 miles/7.2km (map detailed here) and runs parallel to the River. Our dog had a wonderful time swimming in the river and we disturbed thousands of May Flies which were just hatching. Aydon Castle is more like a small, walled manor than a castle but it’s still definitely worth a visit. It’s quaint and quintessentially English. Tucked by the side of a farm, it is complete but very small. You can walk around the wooden board atop the castle and explore the inside of which there’s a surprising number of walls and boards which detail its history. This pleasant walk of 9m/ circumnavigates the most amazing poppy field I’ve ever seen. Prudhoe castle is like a larger version of the secret garden. Hidden in dense foliage with a thick brick wall, you’d be forgiven for missing it as it’s tucked nicely away from the main road in a green oasis. Built after the 1066 Norman conquest, Prudhoe was continuously occupied for over nine centuries. It was originally the home of the Umfravilles but was taken over by the Percy family who restored it. The castle survived two sieges during the 1170s and was the only Northumberland castle to resist the Scots. There’s a good children’s room inside where kids can play with wooden castle bricks. Spread the love of our post by adding this to your pinterest board.